Water fountains only get more disgusting the more you think about them. At best, they're an opportunity for humanity to show how gross it is. At worst, they can apparently spread illnesses through airports. 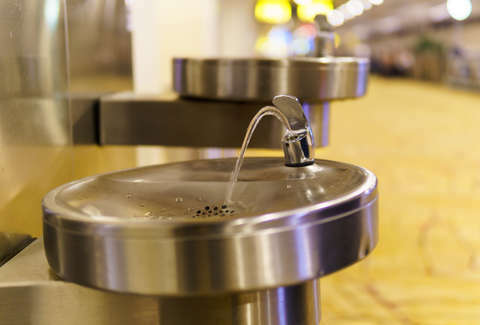 The water fountains in the Frontier Airlines section of Cleveland Hopkins International Airport have been shut down after six passengers became ill on a New Year's Day flight from Cleveland to Tampa, NBC reports. "They were just coming out of nowhere," a passenger told WFLA. "Just throwing up, sick." The passengers on the Frontier Airlines flight reportedly weren't related or traveling together. Once the flight landed, the passengers were removed and held for further observation, and the plane was held for over an hour as medical officials in masks boarded. The water fountains were shut down as a precautionary measure, but it hasn't been confirmed that they were the cause of the incident. CNN reports that the Cleveland Department of Public Health will interview the passengers to determine whether all of them drank from the water fountains. The city of Cleveland pointed out that over 11,000 passengers traveled via the airport on Tuesday without additional reports of illnesses. Frontier Airlines released the following statement: "During Frontier flight 1397 from Cleveland to Tampa this afternoon, six passengers became ill. The aircraft was met by local emergency medical services upon arrival in Tampa. Those passengers displaying symptoms were evaluated by medical staff before being released. All other passengers were released after a brief holding period. The cause of the illness remains under investigation. Passenger safety is Frontier’s number one priority." Whatever the cause turns out to be, maybe never drink from a water fountain again, just in case.